We present FlightPath, a novel peer-to-peer streaming application that provides a highly reliable data stream to a dynamic set of peers. We demonstrate that FlightPath reduces jitter compared to previous works by several orders of magnitude. Furthermore, FlightPath uses a number of run-time adaptations to maintain low jitter despite 10% of the population behaving maliciously and the remaining peers acting selfishly. At the core of FlightPath's success are approximate equilibria. These equilibria allow us to design incentives to limit selfish behavior rigorously, yet they provide sufficient flexibility to build practical systems. We show how to use an ε-Nash equilibrium, instead of a strict Nash, to engineer a live streaming system that uses bandwidth efficiently, absorbs flash crowds, adapts to sudden peer departures, handles churn, and tolerates malicious activity. We develop a novel approach to designing cooperative services. In a cooperative service, peers controlled by different entities work together to achieve a common goal, such as sharing files [13,24] or streaming media [22,26,29]. Such a decentralized approach has several advantages over a traditional client-server one because peer-to-peer (p2p) systems can be highly robust, scalable, and adaptive. However, a p2p system may not see these benefits if it does not tolerate Byzantine peers that may disrupt the service or selfish peers that may use the service without contributing their fair share . We propose approximate equilibria  as a rigorous and practical way to design cooperative services. Using these equilibria, we can design flexible mechanisms to tolerate Byzantine peers. More importantly, approximate equilibria guide how we design systems to incentivize selfish (or rational) peers to obey protocols. Recent deployed systems [13,24] and research prototypes [1,3,26,29,34] build incentives into their protocols because they recognize the need to curb rational deviations. These works fall into two broad categories. The first set includes works that use incentives informally to argue that rational peers will obey a protocol. This approach provides system designers the freedom to engineer efficient and practical solutions. KaZaA  and BitTorrent  are examples of this approach. However, informally arguing correctness leaves systems open to subtle exploits in adversarial environments. For example, users can receive better service quality in the KaZaA network by running KaZaA Lite , a hacked binary that falsifies users' contributions. In a BitTorrent swarm, Sirivianos et al. demonstrate how to free-ride by connecting to many more peers than prescribed, thereby increasing the probability to be optimistically unchoked. The second set of works emphasizes rigor by using game theory to design a protocol's incentives and punishments so that obeying the protocol is each rational peer's best strategy. This approach focuses on crafting a system to be a Nash equilibrium , in which no peer has an incentive to deviate unilaterally from its assigned strategy. The advantage of this more formal technique is that the resulting system is provably resilient to rational manipulation. The disadvantage is that strict equilibrium solutions limit the freedom to design practical solutions, yielding systems with several unattractive qualities. For example, BAR-Backup , BAR Gossip , and Equicast  do not allow dynamic membership, require nodes to waste network bandwidth by sending garbage data to balance bandwidth consumption, and provide little flexibility to adapt to changing system conditions. The existing choices--practical but informal or rigorous but impractical--are discouraging, but approximate equilibria offer an alternative. These equilibria let us give a limited degree of choice to peers, departing from the common technique of eliminating choice to make a cooperative service a strict equilibrium. In FlightPath specifically, approximate equilibria let us use run-time adaptations to tame the randomness of our gossip-based protocol, making it suitable for low jitter media streaming while retaining the robustness and load balancing of traditional gossip. The key techniques enabled by this flexibility include allowing a bounded imbalance between peers, redirecting load away from busy peers, avoiding trades with unhelpful peers, and arithmetic coding of data to provide more opportunities for fruitful trades. FlightPath provides good service to every peer, not just good average service. In our experiments with over 500 peers, 98% of peers deliver every packet of an hour long video. 100% of peers miss less than 6 seconds. FlightPath uses a novel block selection algorithm to cap the peak upload bandwidth so that the protocol is accessible to users behind cable or ADSL connections. FlightPath is a 1/10-Nash equilibrium under a reasonable cost model, meaning that rational peers have provably little incentive to deviate from the protocol. We define an ε-Nash equilibrium in Section 2. FlightPath provides good streaming quality despite 10% of peers acting maliciously to disrupt it. FlightPath maintains good streaming quality while over 30% of the peer population may churn every minute. Further, it easily absorbs flash crowds and sudden massive peer departures. Compared to our previous work , the above properties represent both a qualitative and quantitative improvement. We reduce jitter by several orders of magnitude and decrease the overhead of our protocol by 50% compared to BAR Gossip. Additionally, we allow peers to join and leave the system without disrupting service. Although approximate equilibria provide weaker guarantees than strict ones, they can be achieved without relying on the strong assumptions needed by the existing systems that implement strict Nash equilibria. BAR Gossip assumes that rational participants only pursue short-sighted strategies, ignoring more sophisticated ones that might pay off in the long term. Equicast  assumes that a user is hurt by an infinite amount if it loses any packet of a stream. FlightPath does away with such assumptions, relying instead on the existence of a threshold below which few rational peers find it worthwhile to deviate. We organize the rest of the paper as follows. Section 2 defines the live streaming problem and the model in which we are working. Section 3 describes FlightPath's basic trading protocol and discusses how to add flexibility to improve performance significantly and handle churn. We evaluate our prototype in Section 4 which looks at FlightPath without churn, with churn, and under attack. In Section 5, we analyze the incentives a rational peer may have to cheat. Finally, Section 6 highlights related work and Section 7 concludes this paper. We explore approximate equilibria in the context of streaming a live event over the Internet. A tracker maintains the current set of peers that subscribe to the live event. A source divides time into rounds that are rlen seconds long. In each round, the source generates num_ups unique stream packets that expire after deadline rounds. The source multicasts each packet to a small fraction f of peers. All peers work together to disseminate those packets throughout the system. When a stream packet expires, all peers that possess that packet deliver it to their media application. If a peer delivers fewer than num_ups stream updates in a round, we consider that round jittered and our goal is to minimize such rounds. Our jitter metric is analogous to SecureStream's  continuity index--the ratio of packets delivered on time to total number of packets--when applied to rounds instead of just packets. We assume that the source and tracker nodes run as specified and do not fail, although we could relax this assumption using standard techniques for fault-tolerance [9,39]. Peers, however, may fail. We use the BAR model  to classify peer behaviors as Byzantine, altruistic, or rational. The premise of the BAR model is that when nodes can benefit by deviating, it may be untenable to bound the number of deviations to a small fraction. Thus, we desire to create protocols that continue to function even if all participants are rational and willing to deviate for a large enough gain. While many nodes behave rationally, some may be Byzantine and behave arbitrarily because of a bug, misconfiguration, or ill-will. We assume that the fraction of nodes that are Byzantine is bounded by Fbyz < 1. Altruistic peers obey the given protocol but may crash unexpectedly as can rational peers. Non-Byzantine peers maintain clocks synchronized with the tracker. Nodes communicate over synchronous yet unreliable channels. We assume that each peer has exactly one public key bound to a permanent id. In practice, we can discharge this assumption by using a certificate authority or by implementing recent proposals to defend against Sybil attacks [16,42]. We assume that cryptographic primitives--such as digital signatures, symmetric encryption, and one-way hashes--cannot be subverted. Our algorithms also require that private keys generate unique signatures . We denote a message m signed by peer i as <m>i. Finally, we hold peers accountable for the messages they send. We define a proof of misbehavior (POM)  as a signed message that proves a peer has deviated from the protocol. A POM against a peer is sufficient evidence for the source and tracker to evict a peer from the system, never letting that peer join a streaming session with that tracker or source in the future. We assume that eviction is a sufficient penalty to deter any rational peer from sending a message that the receiver could present as a POM. We analyze and evaluate FlightPath using ε-Nash equilibria . In such an equilibrium, rational players deviate if and only if they expect to benefit by more than a factor of ε. This assumption is reasonable if switching protocols incurs a non-trivial cost such as effort to develop a new protocol, effort to install new software, or risk that new software will be buggy or malicious. Under such circumstances, it may not be worth the trouble to develop or use an alternate protocol. In FlightPath, we assume that protocols that bound the gain from cheating to ε ≤ 1/10 are sufficient to discourage rational deviations. FlightPath is the first peer-to-peer system that is based on an approximate equilibrium. Other works [11,14] have used approximate equilibria only when the strict versions have been computationally hard to calculate. To our knowledge, FlightPath is the first work to explore how these equilibria can be used to trade off resilience to rational manipulation against performance. We assume that a rational peer benefits from receiving a jitter-free stream, and that that benefit decreases as jitter increases. We also assume that a peer's cost increases proportionally with the upload bandwidth consumed. Although FlightPath is not tied to any specific utility function that combines these benefits and costs, we provide one here for concreteness: u=(1-j)β-wκ, where j is the average number of jitter events per minute, w is the average bandwidth used in kilobits per second, β is the benefit received from a jitter free data stream, and κ is the cost for each 1 kbps of upload bandwidth consumed. In Section 5, we show how the ratio of benefit to cost affects the ε we can bound in an ε-Nash equilibrium. We discuss FlightPath's design in three iterations. In the first, we give an overview of a basic structure, inspired by BAR Gossip , that allows peers to trade updates with one another. We design trades to force rational peers to act faithfully in each trade until the last possible action, where deviating can save only negligible cost. This basic protocol allows few opportunities for a peer to game the system, but by the same token, it provides few options for dynamically adapting to phenomena like bad links, malicious peers, or overload. Therefore, in the second iteration, we describe how we add controlled amounts of choice to the basic trading protocol to improve its performance dramatically. In the third iteration, we show how to modify the protocol to deal with changing membership. Readers familiar with related works on rational peers may be surprised to see that in the last two iterations we do not argue step-by-step about incentives. This difference is due to the flexibility of approximate equilibria, which allows optimizations that improve a user's start-to-finish benefits and costs, while still limiting any possible gains from cheating. In Section 5, we demonstrate that FlightPath is a 1/10-Nash equilibrium under reasonable assumptions. Prior to a live event, peers contact the tracker to join a streaming session. After authenticating each peer, the tracker assigns unique random member ids to peers and posts a static membership list for the session. In each round, the source sends two kinds of updates: stream updates and linear digests. A stream update contains the actual contents of the stream. A linear digest  contains information that allows peers to check the authenticity of received stream updates. Linear digests are signed by the source and contain secure hashes of stream updates. We use linear digests in place of digitally signing every stream update to reduce the computational load and bandwidth necessary to run FlightPath. The source sends each of the num_ups unique stream updates for a round to a small fraction f of random peers in the system. When the source multicasts stream updates to selected peers at the beginning of every round, it also sends them the appropriate linear digests. Figure 1: Illustration of a trade in the basic protocol. In each round, peers initiate and accept trades from their neighbors. As in BAR Gossip, a trade consists of four phases: partner selection, history exchange, update exchange, and key exchange. First, a peer selects a partner using a verifiable pseudo-random algorithm . Second, partners exchange histories describing which updates they possess and which they still need. Partners use the histories to compute deterministically the exact updates they expect to receive and are obligated to send, under the constraint that partners exchange equal numbers of updates. Third, partners swap updates by encrypting them and sending the encrypted data in a briefcase message. Immediately afterwards, a peer sends a promise pledging that the contents of its briefcase is legitimate and not garbage data. Promises are the only digitally signed message in a trade; peers authenticate other messages using message authentication codes (MACs). 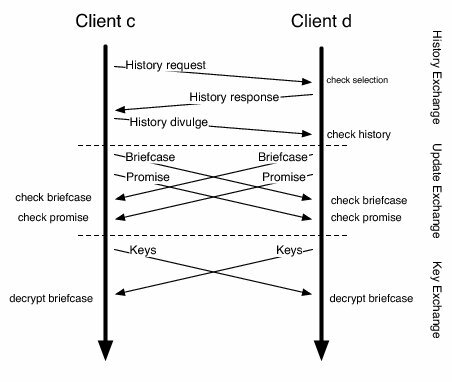 Fourth, once a peer receives a briefcase and a matching promise message from its trading partner, that peer sends the decryption keys necessary to unlock the briefcase it sent. These phases are similar to exchanges in BAR Gossip and they provide a similar guarantee: a rational peer has to upload the bulk of data in a trade to obtain any benefit from the trade. By deferring gratification and holding peers accountable via promise messages, we limit how much a cheating strategy can gain over obeying the protocol . The main difference between a trade in this protocol compared to balanced exchanges in BAR Gossip is the addition of the promise. We structure promises so that for each briefcase there is exactly one matching promise. Further, if a briefcase contains garbage data, then the matching promise is a proof of misbehavior (POM). Briefcases and promises provide this property because of how we intertwine these two kinds of messages. For each update u that a peer is obligated to send, that peer includes the pair <u.id,u<#u>> in the briefcase it sends, where u<#u> denotes update u encrypted with a hash of itself. For each entry in the briefcase, the matching promise message contains a pair <u.id,#(u<#u>)>. Therefore, if a briefcase holds garbage data, then the matching promise message would serve as a POM since that promise would contain at least one pair in which the hash for a self-encrypted update is wrong. Of course, a peer could upload garbage data in its briefcase but send a legitimate promise message to avoid sending a POM, but then the briefcase and promise would not match and that peer's partner would refuse to send the decryption keys. Gossip protocols are well-known for their robustness [7,15] and are especially attractive in a BAR environment because their robustness helps tolerate Byzantine peers. However, while gossip's pair-wise interactions make crafting incentives easier than in a tree-based streaming system, it is reasonable to question whether that very randomness may make gossip inappropriate for streaming live data in which updates must be propagated to all nodes by a hard deadline. Figure 2: Reverse cumulative distribution of jitter. Figure 3: Cumulative distribution of average and peak bandwidths. In this section, we explain how the flexibility of approximate equilibria allows us to tame gossip's randomness by dynamically adapting run-time decisions. For concreteness, we show in Figures 2 and 3 how poorly the basic protocol performs when disseminating a 200 Kbps stream to 517 clients. In this experiment, the source generates num_ups = 50 unique stream updates per round and sends each one to a random f= 5% of the peers. Updates expire deadline = 10 rounds from the time round in which they are sent. 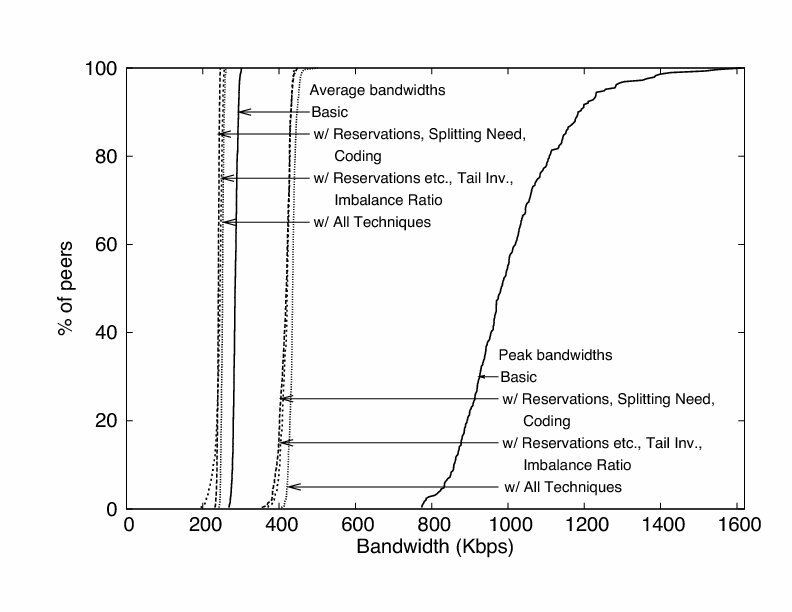 As the figure shows, the first three of the modifications we are about to discuss--reservations, splitting need, and erasure coding--help in capping the peak bandwidth used by the protocol but, by reining in gossip's largesse with bandwidth, make jitter worse. The next three--tail inversion, imbalance ratio, and a trouble detector--reduce jitter by several orders of magnitude. One of the problems of using random gossip to stream live data is the widely variable number of trading partners a peer may have in any given round. In particular, although the expected number of trades in which a peer participates in each round is 2, the actual number varies widely, occasionally going past 8. Such high numbers of concurrent trades are undesirable for two reasons. First, a peer can be overwhelmed and be unable to finish all of its concurrent trades within a round. Figure 3 illustrates this problem as a high peak bandwidth in the basic protocol, making it impractical in bandwidth-constrained environments. Second, a peer is likely to waste bandwidth by trading for several duplicate updates when participating in many concurrent trades. Rather than accept all incoming connections, FlightPath distributes the number of concurrent trades more evenly by providing a limited amount of flexibility in partner selection. The idea is simple. A peer c reserves a trade with a partner d before the round r in which that trade should happen. If d has already accepted a reservation for r, then c looks for a different partner. This straight-forward approach significantly reduces the probability of a peer committing to more than 2 concurrent trades in a round. At the same time, reservations also reduce the probability that a peer is only involved in the trade it initiates. The challenge in implementing reservations is how to give peers verifiable flexibility in their trading partners. FlightPath provides each peer a small set of potential partners in each round. We craft this set carefully to address three requirements: peers need to select partners in a sufficiently random way to retain gossip's robustness, each peer needs enough choice to avoid overloaded or Byzantine peers, and these sets should be relatively unchanged if the population does not change much. Dynamic membership is discussed in Section 3.3, but its demands constrain the partner selection algorithm we describe here. We force each peer to communicate with at least ⌊logn⌋ distinct neighbors by partitioning the membership list of n peers into ⌊logn⌋ bins and requiring a peer to choose a partner from a verifiable pseudorandomly chosen bin each round. Leitao et al. demonstrate that a set of gossip partners that grows logarithmically with system size can tolerate severe disruptions . In round r, peer c seeds a pseudo-random generator with <r>c, and uses the generator to select a bin; note that any peer can verify any other peer's bin selection. Within a bin, we further restrict the nodes with whom a peer can communicate by giving each peer a customized view of each bin's membership based upon a peer's id. 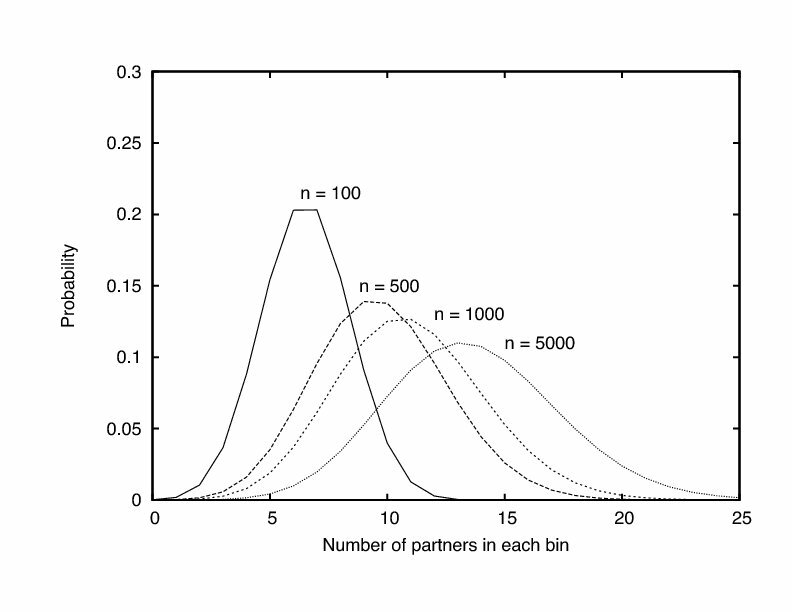 We define c's view to be all peers d such that the hash of c's member id with d's member id is less than some p. The tracker adjusts p according to inequality (1) so that almost every peer is expected to have at least one non-Byzantine partner in every bin. In the inequality, the expression [1-p(1-Fbyz)]n/⌈logn⌉ is the probability that for a given bin, a peer either has no partners or the partners it has are all Byzantine. Figure 4 gives an intuition for how this inequality affects a peer's choices as the system scales up. Figure 4: Distribution of view sizes in each bin for different membership list sizes. Graphs are calculated with Fbyz = 20%. A peer c can use the choice provided by the combination of bins and views to reserve trades. A peer d that receives such a reservation verifies that c's view contains d and that <r>d maps to the bin that contains d's entry in the membership list. If these checks pass, then d can either accept or reject the reservation. As a general rule, peer d accepts a reservation only if it has not already accepted another reservation for the same round. Otherwise, d rejects the reservation, and c attempts a reservation with a different peer. Peer c can be exempt from this rule by setting a plead flag in its reservation, indicating that c has few options left. In this case, d accepts the reservation unless it has already committed to 4 trades in round r.
Reservations are effective in ensuring that peers are never involved in more than 4 concurrent trades. However, a peer that is involved in concurrent trades may still be overwhelmed with more data than it can handle during a round and may still receive too much duplicate data. For example, consider a peer c involved in concurrent trades with peers d0, d1, d2 and d3. Peer c is missing 8 updates for a given round. The basic protocol may overwhelm c and waste bandwidth by having peers d0-d3 each send those 8 updates to c. Something more intelligent is for c's need to be split evenly across its trading partners, limiting each partner to send at most 2 updates. Note that while this scheme may be less wasteful than before, c now risks not receiving the 8 updates it needs since it is unlikely that its partners each independently select disjoint sets of 2 updates to exchange. There seems to be a fine line between being conservative and receiving many duplicate updates to avoid jitter or taking a risk to save resources. We sidestep this trade-off by using erasure coding [4,30]. Erasure coding has been used in prior works to improve content distribution [2,12,18,27], but never to support live streaming in a setting with Byzantine participants. The source codes all of the stream data in a given round into m > num_ups stream updates such that any num_ups blocks are necessary and sufficient to reconstruct the original data. A peer stops requesting blocks for a given round once it has a sufficient number. Erasure coding reduces the probability that concurrent trades involve the same block. In our experiments, we erasure code num_ups stream updates into m = 2num_ups blocks and modify the source to send each one to f/2 of the peers. In Figures 2 and 3, the source generates 2num_ups=100 blocks and sends each one to a random 2.5% of the peers. The modifications introduced so far reduce the protocol's peak bandwidth significantly, but at the cost of making jitter worse. We now describe three techniques that together nearly eliminate jitter without compromising the steps we have taken to keep the protocol from overwhelming any peer. As in many gossip protocols, the basic trading protocol biases recent updates over older ones to disseminate new data quickly. However, in a streaming setting, peers may sometimes value older updates over younger ones, for example when a set of older updates is about to expire and a peer desires to avoid jitter. The drawback in preferring to trade for updates of an old round is that the received updates may not be useful in future exchanges because many peers may already possess enough updates to reconstruct the data streamed in that round. Indeed, an oldest-first bias performs very poorly in our prototype. Therefore, Flightpath provides a peer with the flexibility to balance recent updates that it can leverage in future exchanges against older updates that it may be missing. Instead of requesting updates in most-recent-first order, a peer has the option to receive updates from the two oldest rounds first and then updates in most-recent-first order. Alas, this particular ranking is not the fruit of deep insight--it is simply the one, out of the several we tried, that had the largest impact on reducing jitter: better rankings may well exist. The basic protocol balances trades so that a peer receives no more than it contributes in any round. Such equity can make it difficult for a peer that has fallen behind to recover. FlightPath uses an imbalance ratio α to introduce flexibility into how much can be traded. Each peer tracks the number of updates sent to and received from its neighbors, ensuring that its credits and debits for each partner are within α of each other. We find that the imbalance ratio's most dramatic effect is that it allows individual trades to be very imbalanced if peers have long-standing relationships. When α is set to 1, the trading protocol behaves like a traditional unbalanced gossip protocol, vulnerable to free-riding behavior . When α is set to 0, every trade is balanced, offering little for rational peers to exploit, but also allowing unlucky peers to suffer significant jitter. We would like to set α to be as low as possible while maintaining low jitter; we found α = 10% to be a good tradeoff between these competing concerns. Our final improvement takes advantage of the flexibility in selecting partners that our reservation mechanism offers. Each peer monitors its own performance by tracking how many updates it still needs for each round. If its performance falls below a threshold, then that peer can proactively initiate more than one trade in a round to avoid jitter. Peers treat this option as a safety net, as increasing the average number of concurrent trades also increases the average number of bytes uploaded to trade for each unique update. We implement a simple detection module that informs a peer whether reserving more trades may be advisable. We assume that after each round a peer expects to double the number of updates that have not yet expired up to the point of possessing num_ups updates for each round. In practice, we find that peers typically gather updates more quickly than just doubling them. If a peer c notices that it possesses fewer updates than the detection module advises, c schedules additional trades. Note that this is a local choice, based only on how many packets the peer has received for that round. Figures 2 and 3 demonstrate the effectiveness of tail inversion, the imbalance ratio, and the trouble detector. Figure 5: Illustration of the tub protocol from peer c's perspective. Shaded entries represent peers that c can contact for a trade when appropriate. Note that c only uses bins for its own tub and the immediately preceding one. We now explain how to augment the protocol to handle churn. In FlightPath, the main challenge is in allowing peers to join an existing streaming session. Gossip's robustness to benign failures lends FlightPath a natural resilience to departures. However, the tracker still monitors peers to discover if any have left the system abruptly. Currently, we employ a simple pinging protocol, although we could use more sophisticated mechanisms as in Fireflies . When a peer attempts to join a session, it expects to begin reliably receiving a stream without a long delay. As system designers, we have to balance that expectation against the resources available to get that peer up to speed. In particular, dealing with a flash crowd where the ratio of new peers to old ones is high presents a challenge. Moreover, in a BAR environment, we have to be careful in providing benefit to any peer who has not earned it. For example, if a single peer joins a system consisting of 50 peers, it may be desirable for all 50 to aid the new participant using balanced trades so that the new peer cannot free-ride off the system. However, consider the case when instead of 1 peer joining, 200 or 400 join. It is unreasonable to expect the original 50 to support a population of 400 peers who initially have nothing of value to contribute. Below, we describe two mechanisms for allowing peers to join the system. The first allows the tracker to modify the membership list and to disseminate that list to all relevant peers. The second lets a new peer immediately begin trading so that it does not have to wait in silence until the tracker's list takes effect. A FlightPath tracker periodically updates the membership list to reflect joins and leaves. The tracker defines a new membership list at the beginning of each epoch, where the first epoch contains the first elen rounds, the second epoch contains the next elen rounds and so on. If a peer joins in epoch e, the tracker places that peer into the membership list that will be used in epoch e+2. At the boundary between epochs e and e+1, the tracker shuffles the membership list for epoch e+2 and notifies the source of the shuffled list. Shuffling prevents Byzantine peers from attempting to position themselves at specific indices of the membership list, so as to take over a bin. Recall that we construct each peer's membership view to be independent of these indices so as not to end long-standing relationships prematurely. After the tracker notifies the source of the next epoch's membership list, the source divides that list into pieces and places each piece into a third kind of update: a partial membership list. The source signs these lists and distributes them to peers as it would a stream update. Peers can trade partial membership lists just like they trade linear digests and stream updates. The only difference is that partial membership lists are given priority over all other updates in a trade and only expire when the epoch corresponding to that list ends. Once a peer obtains every partial membership list for an epoch, that peer can reconstruct the original membership list and use it to select trading partners. As described, a new peer would have to wait at least one epoch before it appears in the membership list and can begin to trade. FlightPath augments the static partner selection algorithm that uses bins with an online one that allows new peers to begin trading immediately without overwhelming the existing peers in the system. This algorithm also allows every peer to verify partner selections without global knowledge of how many peers joined nor of when they did so. Intuitively, our algorithm organizes all peers into tubs such that the first tub contains the peers in the current epoch's membership list and subsequent tubs contain peers who have recently joined. A peer selects partners from its own tub and also from any tub preceding its own. However, the probability that a peer from tub t selects from a tub t'<t decreases geometrically with t-t'. This arrangement ensures that the load on a peer from all subsequent tubs is bound by a constant regardless of how many peers join. Figure 5 illustrates our algorithm. For clarity, we describe our online algorithm assuming all peers have a global list that enumerates every peer in the system. Later, we show that this knowledge is unnecessary. The first n indices in this global list correspond to the n indices of the current epoch's membership list. The rest of the global list is sorted according to the order in which peers joined. We divide the global list into tubs where the first tub corresponds to the first n indices of the global list, the second tub to the next n indices, and so forth. Peer d is in c's view only if d precedes c in the list. If d is in tub t or t-1, then d is in c's view iff the hash of concatenating c's member id with d's member id is less than p (see inequality 1). If d is in a tub t'<t-1, then d is in c's view iff the hash of concatenating c's member id and d's member id is less than a parameter p'. The tracker adjusts p according to inequality (2) so that almost every peer is expected to have at least one non-Byzantine partner in every tub. A new peer c in tub tc>1 selects a trading partner for round r using two verifiable pseudo-random numbers, rand1 and rand2. First, c uses rand1 to select a tub, exponentially weighting the selection towards its own tub. If c selects a tub t<tc-1, then c can trade with any peer in tub t that is also in c's view. If c selects either its own tub or the one immediately preceding its tub, then c uses rand2 to make the final selection. c maps rand2 to a bin starting from the first bin in tub t-1 and ending with c's own bin. From the selected bin, c can trade with any peer in its view. If every peer knew the global list, then it would be straight-forward to select and verify trading partners. Fortunately, this global knowledge is unnecessary: to select trading partners, a newly joined peer only needs to know the peers in its own view, the epoch in which those peers joined the system, and the indices of those peers in the global list. When a peer c joins the system, c obtains such information directly from the tracker. To verify that a peer c selects a partner d appropriately, d needs to know c's index in the global membership list. The tracker encodes such information in a join token that it gives to c when c joins the system. The join token specifies c's index in the global list for the two epochs until c is part of an epoch's membership list. c includes its join token in its reservation message to d.
We use FlightPath to disseminate a 200 Kbps data stream to several hundred peers distributed across Utah's Emulab and UT Austin's public Linux machines. In most experiments, we use 517 peers, but drop to 443 peers in the churn and Byzantine experiments as the availability of Emulab machines declined. We run each experiment 3 times. When we present cumulative distributions, we combine points from all three experiments. We include standard deviation when doing so keeps figures readable. In our experiments, rounds last 2 seconds and epochs last 40 rounds. In each round, the source sends 100 Reed-Solomon coded stream updates and 2 linear digests. 50 stream updates are necessary and sufficient to reconstruct the original data. Stream updates expire 10 rounds after they are sent. The source sends each stream update to a random 2.5% of peers. Stream updates are 1072 bytes long, while linear digests are 1153 bytes long. We implement FlightPath in Python using MD5 for secure hashes and RSA-FDH with 512 bit keys for digital signatures. Peers exchange public certificates and agree on secret keys for MACs a few seconds before reserving trades with one another. Peers also set the budget for how many updates they are willing to upload in a round to μ=100, which is split evenly across concurrent trades. In the first experiment, we run FlightPath on 517 peers to assess its performance under a relatively well-behaved and static environment. 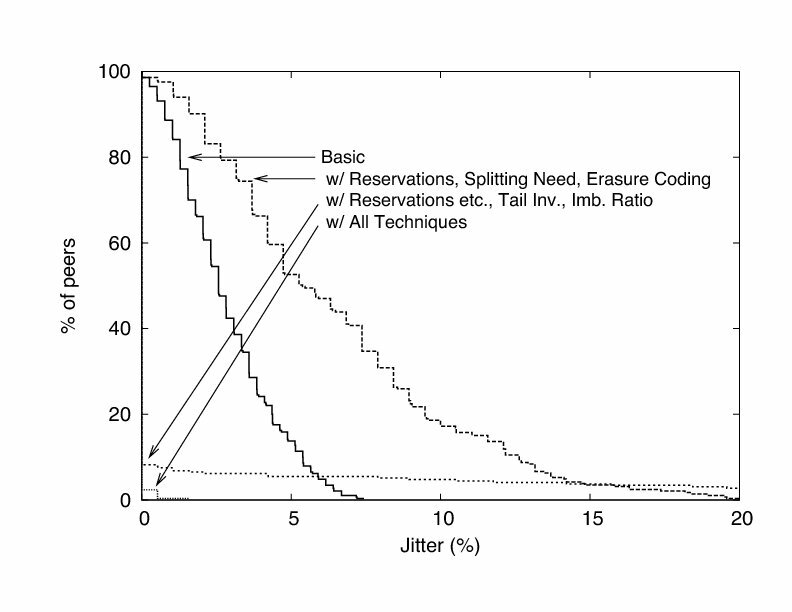 Figure 6 shows that the average jitter of FlightPath is orders of magnitude lower than BAR Gossip. Of the three experiments we ran for one hour, the worst jitter was in an experiment in which 1 peer missed 6 seconds of video, 5 peers missed 4 seconds, and 3 peers missed 2 seconds. All jitter events occurred during the first minute. 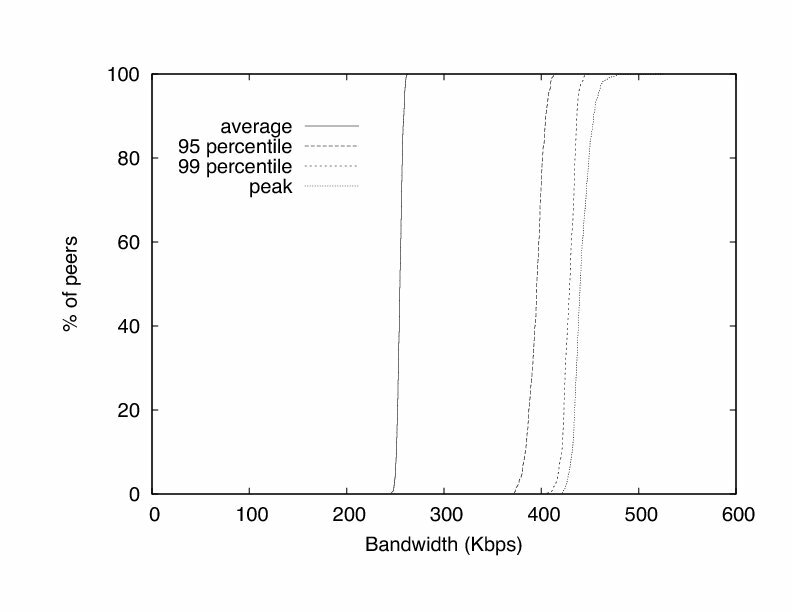 Figure 7 confirms that peers use approximately 250 Kbps on average and also depicts cumulative distributions tracing the peak bandwidth of each peer along with curves for the 99 and 95 percentile bandwidth curves. As in Section 3.2, the combination of reservations, splitting a peer's need and erasure coding is effective in capping peak bandwidth. We now evaluate how well FlightPath handles joins into the system. In particular, we stress the tub algorithm, described in Section 3.3, to handle large populations of peers who seek to join a streaming session all at once. In this experiment, we start a session with 50 peers. 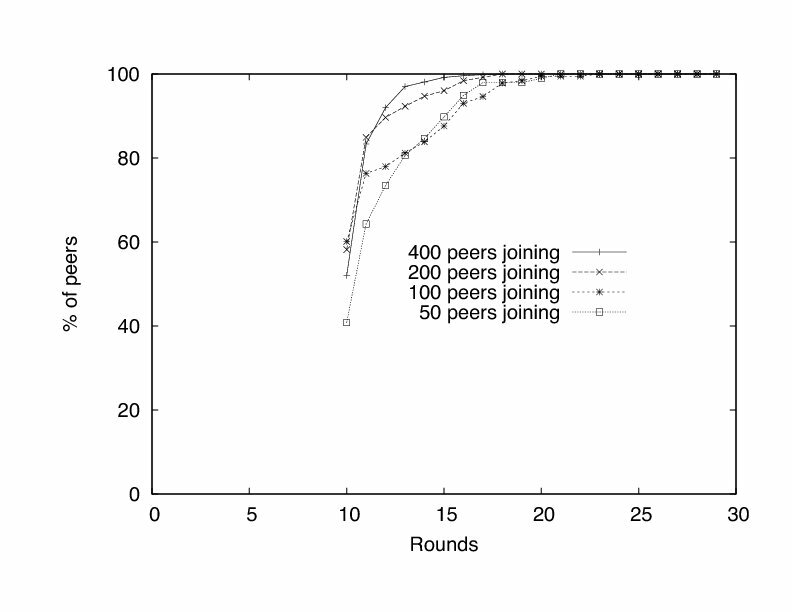 In round 40, varying numbers of peers simultaneously attempt to join the system. As Figure 8 illustrates, the average bandwidth of the original peers noticeably spikes immediately after round 40 and settles to a higher level than before. 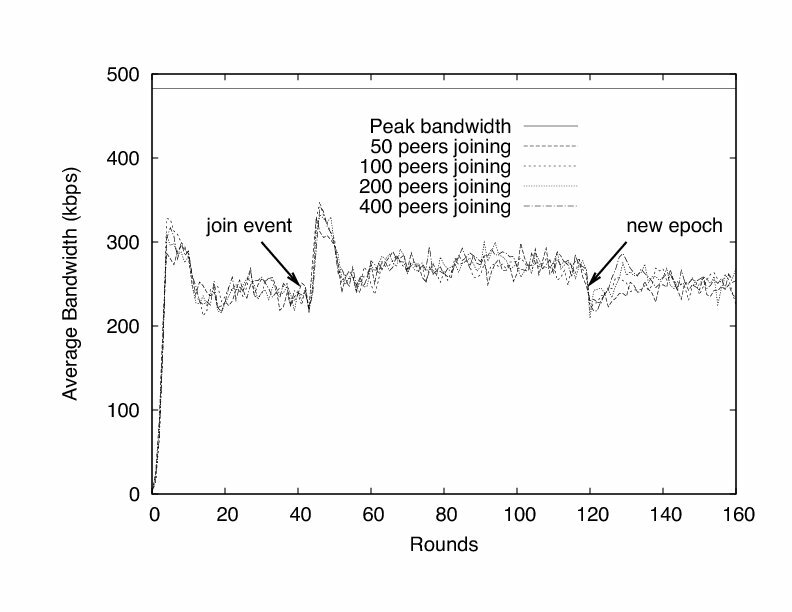 In round 120, when new peers are integrated into the membership list, average bandwidth of the original 50 drops back to its previous levels. As shown, FlightPath peers are relatively unaffected by joining events. None of the original 50 peers experienced a jitter event during any of these experiments. Also note that the peak bandwidth across all three runs of each experiment was 482.5 Kbps. Figure 9 depicts the number of rounds a peer may have to wait before it begins to deliver a stream reliably. We define the round in which a peer reliably begins to deliver a stream as the first round in which a peer experiences no jitter for three rounds. Interestingly, we see that if more peers join, performance improves. This effect can be explained by our tub algorithm. The peers in the last tub are contacted the least. In the experiment in which only 50 peers join, all of the newly joined peers are in the last tub. The last tub in the experiment with 400 peers joining has a similar problem, but the last tub is masked by the success of the preceding 7 tubs. Figure 10 shows FlightPath's resilience to large fractions of a population suddenly departing. Departing peers exit abruptly without notifying the tracker or completing reserved trades. 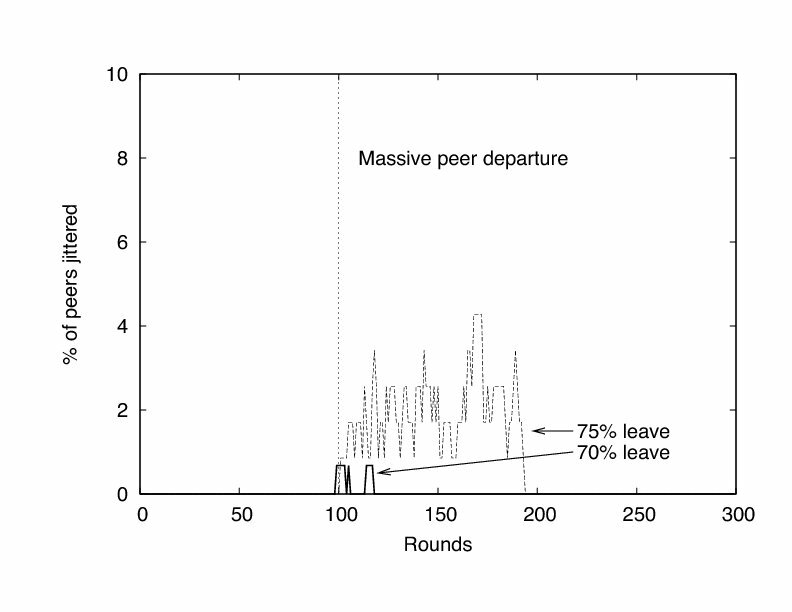 The figure shows the percentage of peers jittered after a massive departure event of 70% and 75% of random peers. We chose these fractions because smaller fractions had little observable effect with respect to jitter. The figure shows that there exists a threshold between 70% and 75% in which FlightPath cannot tolerate any more departures. FlightPath's resilience to such massive departures is a consequence of a few traits. First, peers discover very quickly whether potential partners have left or not via the reservation system. Second, peers have choice in their partner selection, so they can avoid recently departed peers. Finally, each peer's trouble detector helps in reacting quickly to avoid jitter. Figure 11 shows the effect of the trouble predictor. Average bandwidth of remaining peers drops dramatically after the leave event, but then spikes sharply to make up for missed trading opportunities. We now evaluate how FlightPath performs under varying amounts of churn. 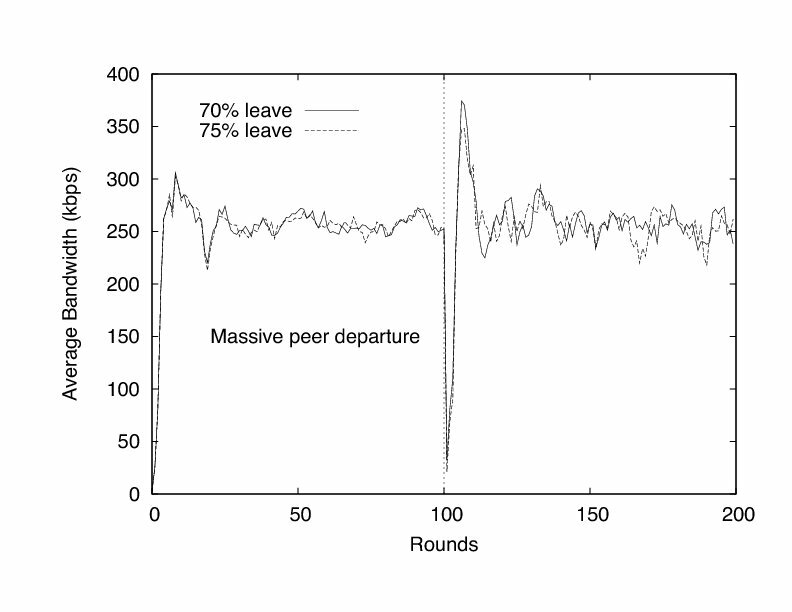 In our experiments, peers join and then leave after an exponentially random amount of time. Because short-lived participants are proportionally more affected by their start-up transients, our presentation segregates peers by the amount of time they remain in the system. 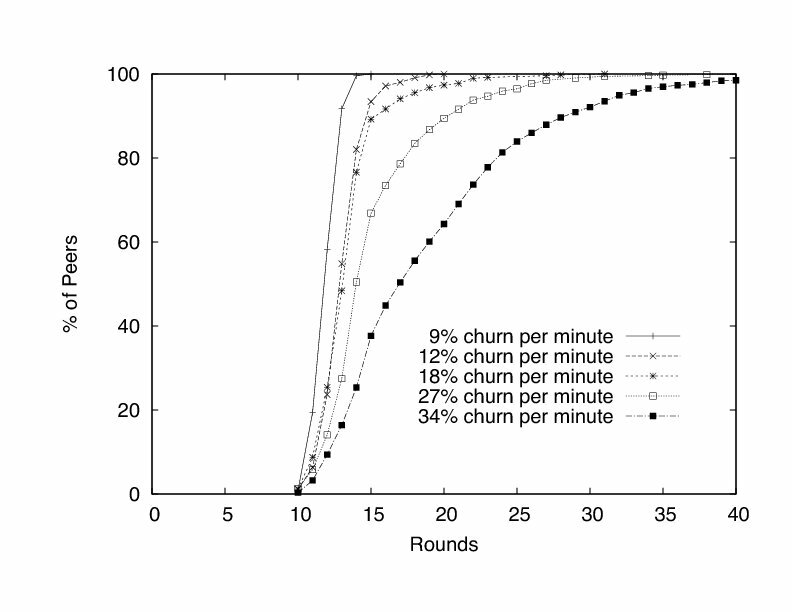 Figure 12 shows average jitter as we increase churn. 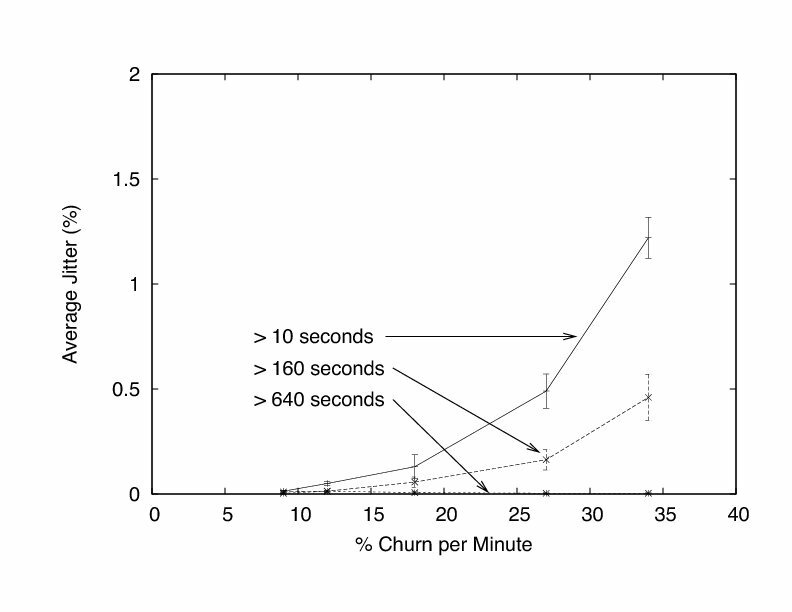 The average jitter of peers who join the system for at least 10 seconds steadily increases with churn. Peers who stay in the system for at least 640 seconds experience very little jitter even when 37% of peers churn every minute. Further experiments (not included) show that there is a non-negligible probability of being jittered during the first two minutes after joining a streaming session. Afterwards, the chance of being jittered falls to nearly 0. Figure 13 shows that churn does manifest as increasing join delays for new peers. We see that the time needed to join a session is unacceptable under high amounts of churn. This quality points to a weakness of FlightPath and suggests a need for a bootstrapping mechanism for new peers. However, care needs to be exercised in not allowing peers to game the system by abusing the bootstrapping mechanism to obtain updates without uploading. In this experiment, we evaluate FlightPath's ability to deliver a stream reliably in the presence of Byzantine peers. 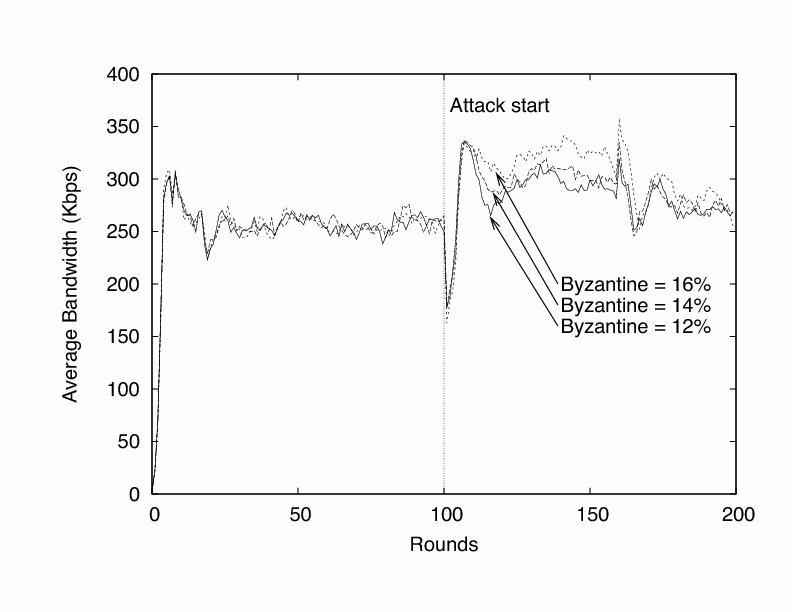 While any peer whose utility function is unknown is strictly speaking Byzantine in our model, we are especially interested in understanding how FlightPath behaves under attack, when Byzantine peers behave maliciously. Although Byzantine peers cannot make a non-Byzantine peer deliver an inauthentic update, they can harm the system by degrading its performance. We have studied the effect on jitter of several malicious strategies--we report here the results for the one that appeared to cause the greatest harm. According to this scheme, malicious peers act normally for the first 100 rounds of the protocol. However, starting in round 100, they initiate as many trades as they can and respond positively to all trade reservations, seeking to monopolize as many trades in the system as possible. The Byzantine peers participate in the history exchange phase of a trade but in no subsequent phase. In a history exchange, a Byzantine peer reports that it has all the updates that are less than 3 rounds old and is missing all the other updates. This strategy commits a large amount of its partners bandwidth to the exchange. Ultimately, however, non-Byzantine peers find trades with Byzantine ones useless. Figure 14 shows the percentage of peers jittered when 12%, 14%, and 16% of peers behave in this malicious way. We elide the experiment in which 10% of peers are Byzantine because no peer suffered jitter in those experiments. Figure 15, which depicts the average bandwidth of non-Byzantine peers, is similar to the one in which peers abruptly leave the system. The subtle difference is that the average bandwidth used remains higher with more Byzantine peers. 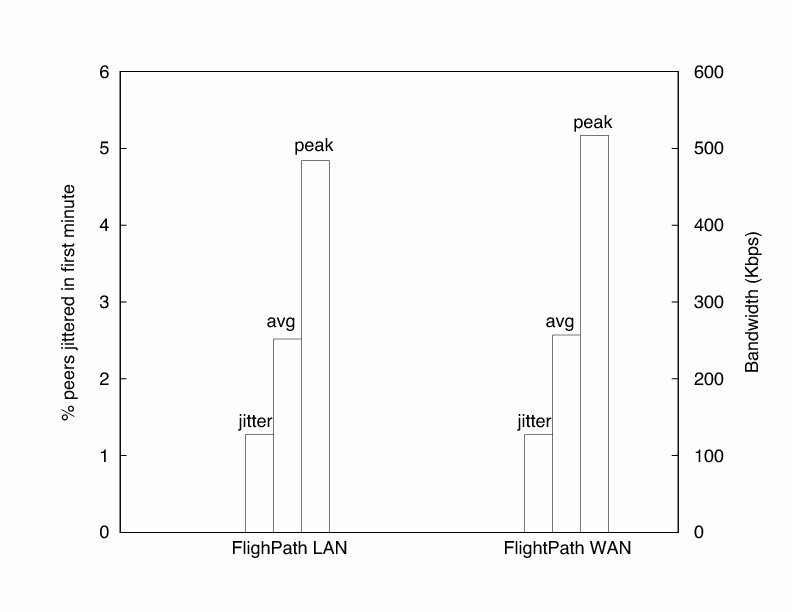 Finally, we evaluate how FlightPath performs under wide area network conditions. In this experiment, we use 300 clients on a local area network but delay all packets between clients according to measured Internet latencies. We assign each client a random identity from the 1700+ hosts listed in the King data set of Internet latencies . We use the data set to delay every packet according to its source and destination. As in the case without added delays, all jitter events occurred in the first minute of the experiments. Figure 16 depicts the average percentage of peers jittered in the first minute, the average upload bandwidth, and the peak upload bandwidth for our experiments with the added delays and without. Aside from a slight increase (almost 10 Kbps) in average upload bandwidth, peak upload bandwidth rose by approximately 40 Kbps. These increases are the result of some exchanges not completing by the end of a round, requiring peers involved to make up for the loss in subsequent rounds. In contrast to previous rigorous approaches to dissuade rational deviation, FlightPath does not ensure that every step of the protocol is in every peer's best interest. Indeed, it is easy to imagine circumstances in which a peer might benefit from deviating, for example, by setting the plead flag early to increase the likelihood that a selected peer will accept its invitation. Instead, FlightPath ensures an ε-Nash equilibrium in which no peer can significantly improve its overall utility regardless of how it makes these individual choices. The high level argument is simple. A peer can only increase its utility by obtaining more benefit (receiving less jitter) or reducing cost (uploading fewer bytes). Since we engineered FlightPath to provide very low jitter in a wide range of environments, a peer has very little ability to obtain more benefit. With respect to decreasing costs, we structure trades so that a rational peer has to pay at least ⌈1/(1+α)⌉ of the cost of uploading x updates in order to receive x updates, where α is the imbalance ratio. We now develop this argument more formally to bound the added utility that can be gained by a peer that deviates. We analyze FlightPath in the steady state case and ignore transient start-up effects or end game scenarios, which would matter little in the overall utility of watching something as long as a movie. We simplify equation 3 with the following assumptions: i) the benefit of running FlightPath exceeds the cost, ii) the optimal cheating strategy receives no jitter, and iii) the optimal cheating strategy uses a fraction b<1 of the bandwidth of running the protocol. These assumptions let us express ε as a function of the benefit-to-cost ratio c, the expected number of jitter events per minute je, and the proportional savings in cost 1-b. Table 1: Summary of the analysis parameters. As the jitter expected is an empirical phenomenon, we use our evaluation to determine je, which after the first minute is 0. We then establish a lower bound on b using parameters specific to our system, listed in Table 1. Figure 17: ε as a function of the benefit to cost ratio. In the steady state, a peer p following a hypothetical optimal strategy participates on average in at least one trade every t = ⌊budget/(num_ups-mf)⌋ rounds. Furthermore, the average number of updates that it needs in each trade is needed=t(num_ups-mf). Assuming that p is lucky or clever enough to upload no more updates than it has to in all trades, then p still uploads at least min_up = ⌈needed/(1+α)⌉ updates on average in each trade. Let γ be the fixed cost in kilobits of a trade and let ρ be the increase in cost of a trade for each update p uploads. Then the average cost that p has to pay for each trade is γ+min_up x ρ. Given the message encodings in our prototype, the fixed cost of a trade is 305 bytes and the increase for each uploaded update is 1104 bytes. These values correspond to γ=2.44 and ρ=8.832. Our goal is to ensure that the net utility of the optimal strategy is not significantly more than for FlightPath's strategy. For ε=1/10, solving for c in Equation 3 indicates that FlightPath is a 1/10-Nash equilibrium as long as the user values the stream at least 3.36 times as much as the bits uploaded to participate in the system. Figure 17 illustrates the ε value FlightPath provides for each benefit-to-cost ratio. This work builds on a broad set of approaches for content dissemination and Byzantine or rational-tolerant protocols. 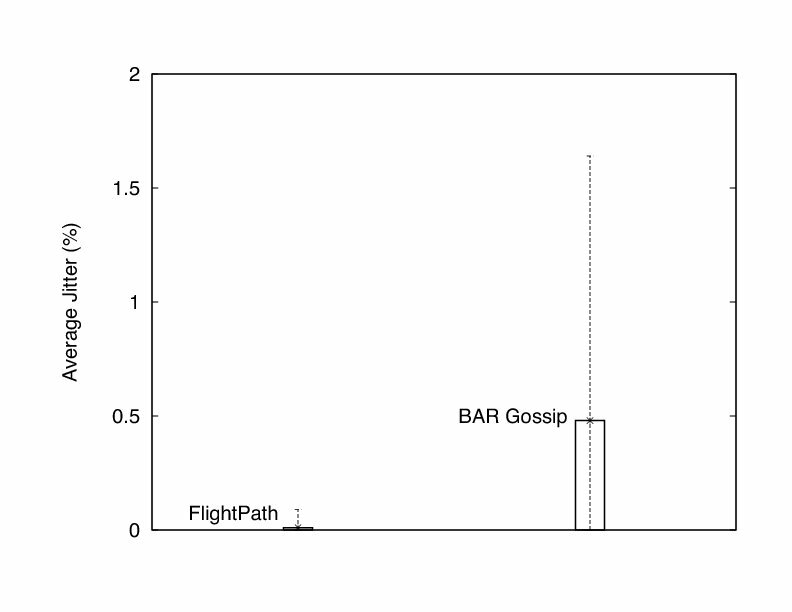 Clearly, BAR Gossip  is the work most closely related to FlightPath. We explain how it is similar and different from FlightPath throughout this paper, and in particular in Section 3. Several tree-based overlays [10,23] have been devised to disseminate streaming data. Ngan et al. suggest that restructuring Splitstream  trees can guard against free-riders by periodically changing the parent-child relationships among peers, a communication pattern that begins to resemble gossip. Chunkyspread  uses a multi-tree based approach to multicast. Chunkyspread builds random trees using low overhead bloom filters and allows peers to make local decisions to tune the graph for better performance. In Araneola , Melamed and Keidar construct random overlay graphs to multicast data. They show that Araneola's overlay structure achieves mathematical properties important for low-latency, load balancing, and resilience to benign failures. Demers et al. introduced gossip protocols to manage consistency in Xerox's Clearinghouse servers . Years later, Birman et al. used gossip to build a probabilistic multicast--a middle ground between existing reliable multicast and best effort multicast protocols. Since then, many have explored ways to improve gossip's throughput and robustness [8,17,20,21,28]. None of the above works consider Byzantine peers who can harm the system by spreading false messages. One can guard against such attacks by using techniques that avoid digital signatures [31,32], but signatures can dramatically simplify protocols and are used in many practical gossip implementations [8,22,29,40]. Haridasan and van Renesse  build a Byzantine fault-tolerant live streaming system over the Fireflies system. Their system, SecureStream, introduces linear digests to efficiently authenticate stream packets. As in CoolStreaming  and Chainsaw , SecureStream also uses a pull-based gossip protocol to reduce the number of redundant sends. Badishi et al. show in DRUM how gossip protocols can resist Denial-of-Service (DoS) attacks by resource bounding public ports and port hopping. We could integrate DRUM's techniques into FlightPath. To our knowledge, Equicast  is the first work to address formally rational behavior in multicast protocols. Equicast organizes peers into a random graph over which it disseminates content. The authors prove Equicast is an equilibrium, but assume that rational peers lack the expertise to modify the protocol beyond tuning the cooperation level. Currently, Equicast is a purely theoretical work, making an empirical comparison with FlightPath difficult. BAR-Backup  is a p2p backup system for Byzantine and rational peers. Peers implement a replicated state machine that moderates interactions between peers to ensure that peers behave appropriately. We present approximate equilibria as a new way to design cooperative services. We show that approximate equilibria allow us to provably limit how much selfish participants can gain by deviating from a protocol. At the same time, these equilibria provide enough freedom to engineer practical solutions that are flexible enough to handle many adverse situations, such as churn and Byzantine peers. We use ε-Nash equilibria, an example of an approximate equilibrium, to design FlightPath, a novel p2p live streaming system. FlightPath improves on the existing state-of-the-art both qualitatively and quantitatively, reducing jitter by several orders of magnitude, using bandwidth efficiently, handling churn, and adapting to attacks. More broadly, FlightPath demonstrates that we do not have to sacrifice rigor to engineer Byzantine and rational-tolerant systems that perform well and operate efficiently. The authors would like to thank the anonymous reviewers and our shepherd, Dejan Kostic. Special thanks to Petros Maniatis and Taylor Riché for their comments on earlier versions of this work. This project was supported in part by NSF grant CSR-PDOS 0509338. I. Abraham, D. Dolev, R. Gonen, and J. Halpern. Distributed computing meets game theory: robust mechanisms for rational secret sharing and multiparty computation. In Proc. 25th PODC, pages 53-62, July 2006. R. Ahlswede, N. Cai, S.-Y. Li, and R. Yeung. Information Theory, IEEE Transactions on, 46(4):1204-1216, Jul 2000. In Proc. 20th SOSP, pages 45-58, Oct. 2005. N. Alon, J. Edmonds, and M. Luby. Linear time erasure codes with nearly optimal recovery. In FOCS '95, page 512, Washington, DC, USA, 1995. IEEE Computer Society. G. Badishi, I. Keidar, and A. Sasson. Exposing and eliminating vulnerabilities to denial of service attacks in secure gossip-based multicast. In Proc. DSN-2004, page 223, Washington, DC, USA, 2004. IEEE Computer Society. M. Bellare and P. Rogaway. In Proc. 1st CCC, pages 62-73, New York, NY, USA, 1993. ACM Press. K. P. Birman, M. Hayden, O. Oskasap, Z. Xiao, M. Budiu, and Y. Minsky. ACM TOCS, 17(2):41-88, May 1999. K. P. Birman, R. van Renesse, and W. Vogels. Spinglass: Secure and scalable communications tools for mission-critical computing. M. Castro, P. Druschel, A.-M. Kermarrec, A. Nandi, A. Rowstron, and A. Singh. SplitStream: high-bandwidth multicast in cooperative environments. In Proc. 19th SOSP, pages 298-313. ACM Press, 2003. S. Chien and A. Sinclair. Convergence to approximate nash equilibria in congestion games. In SODA '07, pages 169-178, Philadelphia, PA, USA, 2007. Society for Industrial and Applied Mathematics. P. A. Chou, Y. Wu, and K. Jain. In P2PECON '03, June 2003. C. Daskalakis, A. Mehta, and C. Papadimitriou. A. Demers, D. Greene, C. Houser, W. Irish, J. Larson, S. Shenker, H. Sturgis, D. Swinehart, and D. Terry. In Proc. 11th SOSP, Aug. 1987. In Proc. 1st IPTPS, pages 251-260. Springer-Verlag, 2002. P. Eugster, S. Handurukande, R. Guerraoui, A. Kermarrec, and P. Kouznetsov. In DSN '01, pages 254-269, July 2001. C. Gkantsidis and P. Rodriguez. Network coding for large scale content distribution. INFOCOM, 4:2235-2245 vol. 4, March 2005. SIGCOMM Comput. Commun. Rev., 32(3):11-11, 2002. I. Gupta, K. Birman, and R. van Renesse. Fighting fire with fire: using randomized gossip to combat stochastic scalability limits. Journal of Quality and Reliability Engineering International, 18(3):165-184, 2002. I. Gupta, A.-M. Kermarrec, and A. J. Ganesh. Efficient and adaptive epidemic-style protocols for reliable and scalable multicast. M. Haridasan and R. van Renesse. Defense against intrusion in a live streaming multicast system. In Proceedings of P2P '06, pages 185-192, Washington, DC, USA, 2006. IEEE Computer Society. J. Jannotti, D. K. Gifford, K. L. Johnson, M. F. Kaashoek, and J. James W. O'Toole. In Proceedings of OSDI '00, pages 14-14, Berkeley, CA, USA, 2000. USENIX Association. I. Keidar, R. Melamed, and A. Orda. Equicast: Scalable multicast with selfish users. D. Kostic, A. Rodriguez, J. Albrecht, and A. Vahdat. In SOSP '03, pages 282-297, New York, NY, USA, 2003. ACM. J. Leitao, J. Pereira, and L. Rodrigues. Hyparview: A membership protocol for reliable gossip-based broadcast. In DSN '07, pages 419-429, Washington, DC, USA, 2007. IEEE Computer Society. H. C. Li, A. Clement, E. Wong, J. Napper, I. Roy, L. Alvisi, and M. Dahlin. In Proceedings of OSDI '06, pages 191-204, Nov. 2006. M. G. Luby, M. Mitzenmacher, M. A. Shokrollahi, D. A. Spielman, and V. Stemann. In STOC '97, pages 150-159. ACM Press, 1997. D. Malkhi, Y. Mansour, and M. K. Reiter. D. Malkhi, M. Reiter, O. Rodeh, and Y. Sella. In Proc. 20th SRDS, 2001. R. Melamed and I. Keidar. Araneola: A scalable reliable multicast system for dynamic environments. In Proc. of NCA '04, pages 5-14, Washington, DC, USA, 2004. IEEE Computer Society. T. Moscibroda, S. Schmid, and R. Wattenhofer. 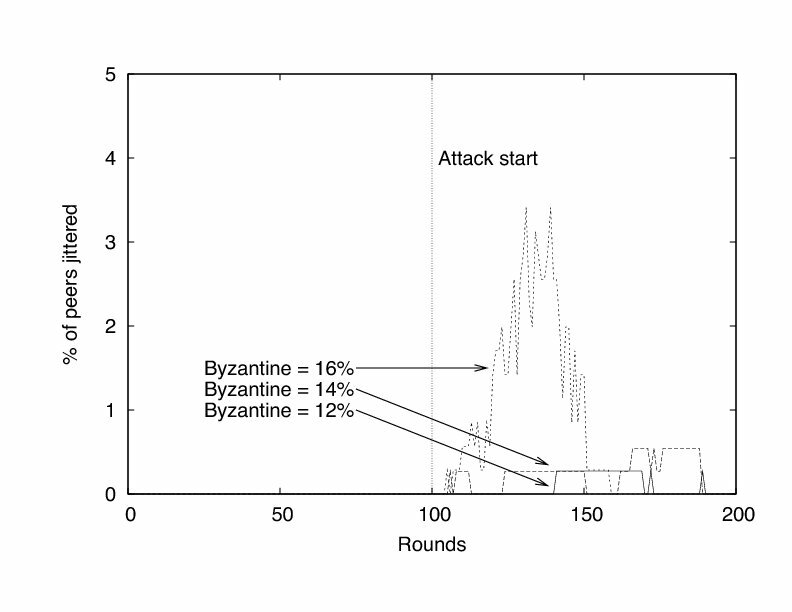 When selfish meets evil: Byzantine players in a virus inoculation game. In Proc. 25th PODC, pages 35-44, July 2006. The Annals of Mathematics, 54:286-295, Sept 1951. T.-W. Ngan, D. S. Wallach, and P. Druschel. V. Pai, K. Kumar, K. Tamilmani, V. Sambamurthy, and A. Mohr. Chainsaw: Eliminating trees from overlay multicast. In IPTPS '05, February 2005. M. Sirivianos, J. H. Park, R. Chen, and X. Yang. In IPTPS '07, February 2007. R. van Renesse, K. P. Birman, and S. Maffeis. Horus: A flexible group communication system. R. van Renesse, H. Johansen, and A. Allavena. Fireflies: Scalable support for intrusion-tolerant overlay networks. J. Venkataraman, P. Francis, and J. Calandrino. In IPTPS '06, February 2006. H. Yu, M. Kaminsky, P. B. Gibbons, and A. Flaxman. Sybilguard: Defending against sybil attacks via social networks. In ACM SIGCOMM '06, Sept.
X. Zhang, J. Liu, B. Li, and T. P. Yum. CoolStreaming/DONet: A data-driven overlay network for live media streaming. In IEEE INFOCOM, Mar. 2005.